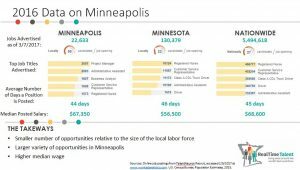 In the Twin Cities, the workforce is mobile. 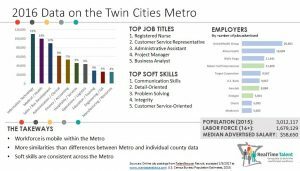 Although differences exist between the candidate pools and job opportunities found in each of the metro’s seven counties, there are more similarities than differences. Metro employers continue to seek out candidates with a strong foundation in soft skills including communication, attention to detail, problem solving, and customer service. Information Technology is the top job function area in demand in the metro area, with a particular focus around business information management, healthcare IT, and cybersecurity in finance IT. 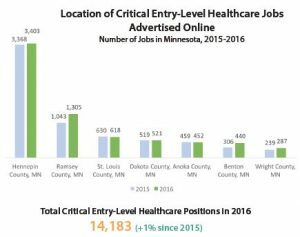 For more details on the booming job market in the Twin Cities Metro, take a look at our recent report or the summary slides linked below. RealTime Talent’s newest platform, the Exchange, was featured in Twin Cities Business Magazine this week in a story highlighting the Minnesota High Tech Association’s new site. The story was picked up at MHTA’s Tech.2017 breakfast which was held at the Metropolitan Ballroom last week and drew around 200 leaders in high tech innovation. Featured in the article are insights from Margaret Anderson Kelliher, President and CEO of MHTA, and WorkFountain’s Program Manager for Minnesota, Dave Kornecki.